The ultimate travel binocular needs to be tough enough to handle most of what you can throw at them, be small enough to easily carry with you on your adventures and yet still be able to perform well even when light conditions are not optimal enabling you to enjoy the best views possible. It is for these reasons that mid-sized binoculars have become so popular and not just for travelling either, these core attributes make them very versatile. 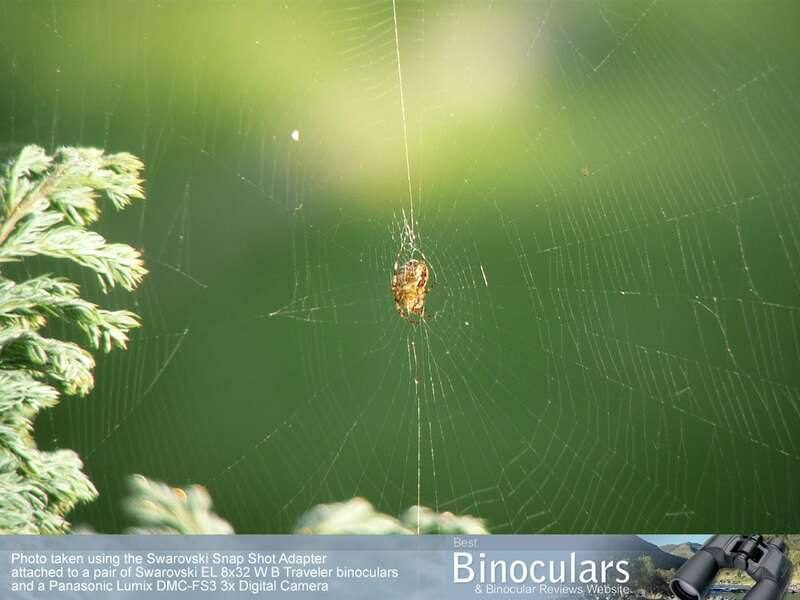 But to make a binocular with relatively small objective lenses perform well, even in poor light conditions is not easy. Many get the formula wrong as some are either too bulky to satisfy those looking for a binocular that is very easy to carry about or their optical performance (especially brightness) falls well short of even an average full sized binocular. What is instantly noticeable on the Swarovski Traveler binoculars is their brown external housing which I really like and is as far as I can tell, the only difference between these and the standard Swarovski EL 8x32 W B binoculars that come with a green housing. Unlike most binoculars that you find these days, this tough grippy surface does not cover the whole body and is only found on the parts of the barrels that you will use to hold them. This not only creates a good looking two tone effect with the central magnesium chassis left exposed., but I am also sure helps to keep the weight of the optics down. This does however mean that the internal optics are probably a little less protected than if they were fully armored, but I must stress that the most vulnerable areas are protected. I also personally love the open bridge design that is becoming more and more popular these days. Not only are do the feel really comfortable to hold up to your face but your grip on them, even with one hand is that much more secure. This is really important when for example you are walking through dense vegetation as the chances of them being knocked out of your hand is greatly reduced. On the underside of the body there are two thumb indents, these are well placed and really do add to the comfort and balancing of the binoculars when holding them up to your eyes. I also like the fact that the objective lenses are set fairly far back within the body, this combined with the hard rubber surround from the body armouring offers them plenty of protection from the elements in general usage. The twist-up eyecups seem to be made from what looks like aluminium or something similar which are then covered in a thin soft rubber coating which feel pretty comfortable even when pushed quite firmly against your face. The twist-up mechanism is also really smooth and works very well and whilst they don't have any fixed intermediate stops, you can position them at any position (distance) which offers the ultimate in terms of being able to adjust the eye-relief to your exact needs. The maximum of 15mm of eye-relief is adequate and should be enough for most people who wear glasses to be able use these optics without having to remove their glasses and still get the full field of view without any vignetting. Non-eyeglass wearers will just use the eyecups in the fully extended position. Focusing is achieved via the very large center focus knob that turns very smoothly. It looks to be made from a combination of metal and a very hard plastic that has then been covered with a ridged rubberized coating to help with grip. In my hands it felt very well positioned, meaning that I could easily adjust the focus without having to change my grip on the optics. To go from infinity to it's closest focusing distance of 7 feet (2.1 meters) takes about 1 and 1/2 turns of the dial. This means that focusing from near to far (or vise versa) is not as quick as binoculars that have a more aggressive mechanism, but it does make fine tuning your focus that much easier. I have reviewed some binoculars that take even less than a full turn and many that take two full turns or more to go from one extreme to the other, but I feel that Swarovski has got the balance just about right with these, but at the end of the day this is just down to personal preference. Unlike the majority of binoculars that position the diopter adjustment on a barrel of the binoculars, the diopter adjustment on these Swarovski EL binoculars has been integrated into the focussing wheel. For those who don't know, this allows you to adjust the lenses separately to allow for differences in each of your eyes and plays an important part in correctly setting up & focusing your binoculars. 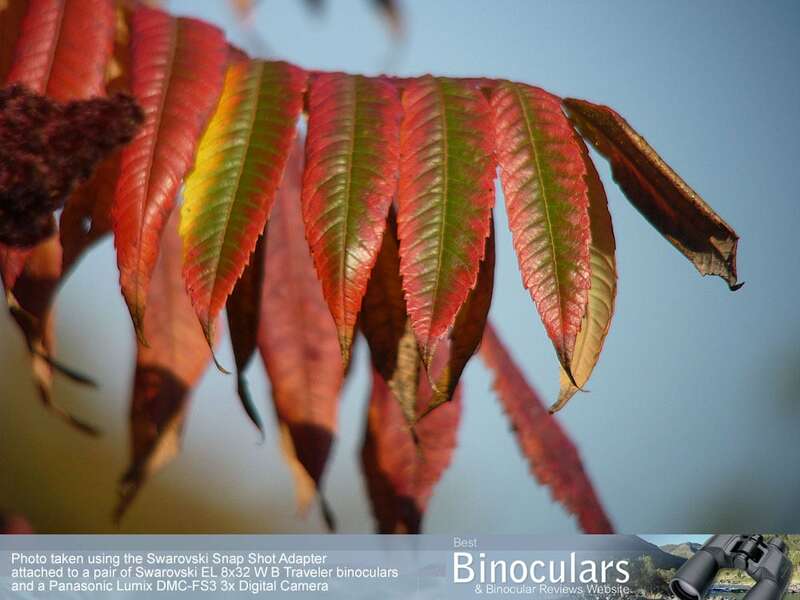 To adjust the setting, and to set up the binoculars for your eyesight, first you focus the binos on something with only your left eye, (keeping your right eye closed as is normal), then you pull back on the focussing wheel which makes a rather satisfying click and which then exposes the excellently labeled graduated scale. Then you close your left eye and look through the binos with your right eye and then just turn the wheel as you would during normal focussing, the wheel now turns with a number of click-stops until the right eye is perfectly focused on the same object, then click the diopter adjustment/focusing wheel back into place to lock in your setting. Take a note of this incase you or someone else changes it and you are done. The fact that the diopter control is also lockable is another really nice touch and is another sign of the quality and attention to detail on these optics as it prevents you from accidentally changing your setting. And even if you were to change it accidentally or because you are sharing your optics with someone with a different setting, changing it back is very simple as the graduated scale is really obvious and all you have to do is remember where your "spot" is. This is usually not the case on most binoculars that I review and I often recommend that people mark their own setting if it is not neutral using a pen or even by making a small etch with a knife. 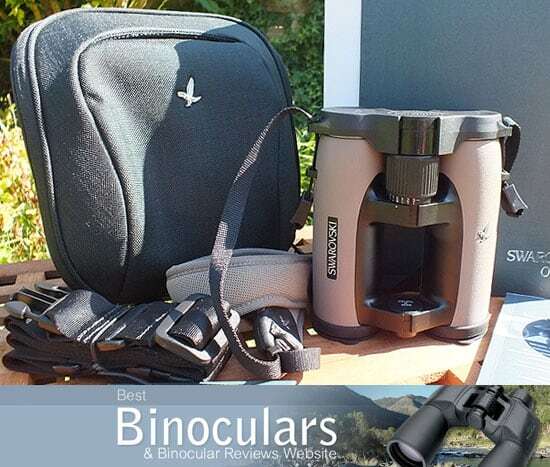 These Swarovski EL 8x32 Traveler binoculars are airtight and 100% waterproof which will not only protect them from moisture, but will also prevent any dust and other small debris from entering them that could lead to your view being spoilt. 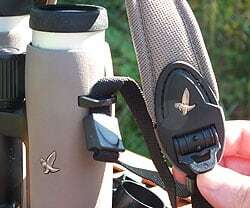 The air inside of the binocular has also been replaced with dry nitrogen gas during the manufacturing process to prevent internal fogging and thus makes it possible to use the binoculars in places where there are very low temperatures, high humidity levels or rapid temperature changes without the risk of any condensation forming on the inside the binocular. A side benefit of this is that because there is no internal moisture, it also protects the inner workings from corrosion. These Swarovski 8x32 binoculars weigh 610g (21.5oz), which for a quality mid-sized binocular with objective lenses of around 32mm is pretty good. For comparison, the excellent Minox 8x33 BL Binoculars weigh 649g (22.9oz) and the top of the range Nikon EDG 8x32 weigh 655g (23.1oz). Whilst it is also true to say that you can find lighter mid-sized binoculars, weight alone can sometimes be a little misleading. This is because sometimes featherweight binoculars are only light because they have been constructed from cheap and poor quality materials and components that also happen to be light. Their dimensions of 13.8 x 11.4 x 6.0cm (5.4 x 4.5 x 2.4in) are also pretty good and they compare well with most other quality mid-sized binoculars and as you would expect are quite a bit smaller than most full sized optics, yet larger than full compacts. The overall balance of these Swarovski binoculars is excellent, this is where the well placed thumb indents that encourage you to get your hands into exactly the right position really help. Whilst the balance on smaller, lighter binoculars like these is not as important as on larger optics, it is still something that should be taken into consideration. 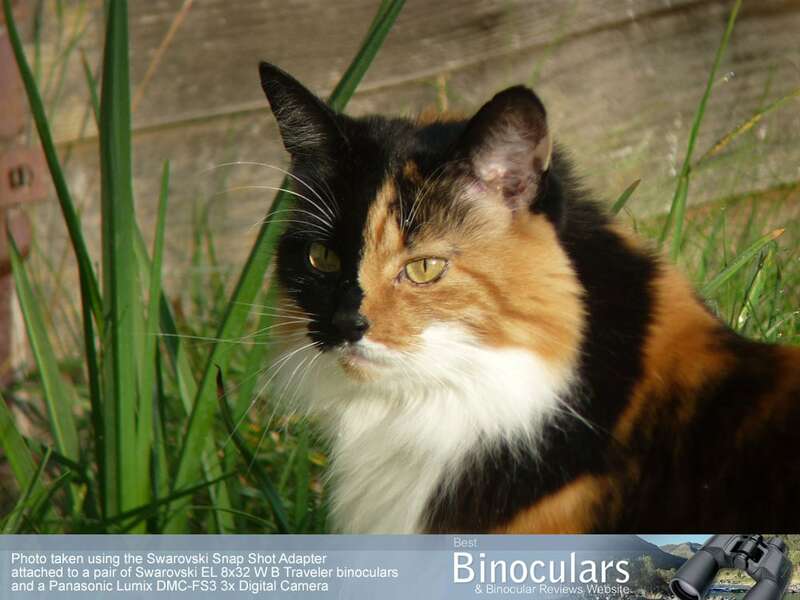 A well balanced binocular is far more comfortable to use, especially over longer periods of observation. The also make it far easier to keep the device still, helping you maintain a steady, shake free view. As you would expect to find on any good quality roof prism binocular, Swarovski use higher spec BaK-4 prisms on these traveler's as opposed to the cheaper and inferior BK-7 prisms. As well as this, these prisms also have a number of features and coatings that help to increase their transmittance and the quality of the image produced. Fully multi-coated lenses are used, this means that all air-to-glass surfaces have received multiple layers of anti-reflective coatings. This has the effect of increasing the amount of light transmitted compared to cheaper optics that only use multi-coated or just coated lenses and results in a brighter image and therefore binoculars that perform better in low light. Swarovski have also used phase-correction coatings on the roof prism glass. Roof prism binoculars like these have many advantages over porro prisms, but when light waves are reflected at the opposite faces of a roof prism, phase shift occurs resulting in marginal deterioration in sharpness. So what these phase correction coatings do is keep the light in the correct color phases and therefore produce images that have better contrast, a higher resolution and have a better color reproduction than roof prism binoculars that don't have these coatings. These coatings are only really found on high end optics. The prisms also have Swarovski's own prism coating called Swarobright, which is basically a highly reflective prism coating that maximises true reflection over the entire colour spectrum to produce a true colour output. I am not completely sure, as Swarovski are a little secretive on the exact make up of these coatings, but my guess is that they are the same or very similar to the dielectric prism coatings found on other high end binoculars. The EL Traveler also features Swarovski's Swaroclean Lens Coating on the lenses that repels water. This not only helps with the view in damp conditions, but means you need to clean your lenses less often and when you do have to clean the objective and eyepiece lenses it is now much easier meaning that the lenses require less vigorous cleaning, which will significantly increase the life of your optics. The minimum close focusing distance is a pretty good 7 feet (2.1m). 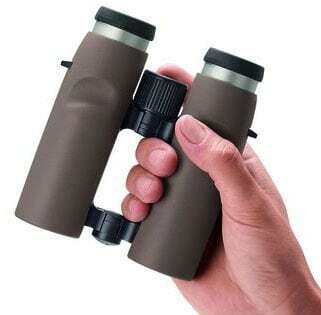 I regard anything under 6ft as being very good, so if you are looking for a mid size binocular that is also good for viewing objects close up, things like butterflies for example, these will hold their own, but would not be ideal if this is your main intended use for them. Their maximum eye-relief of 15mm is also good and this should be enough for most people who wear glasses. As I do for all my reviews, I compared the view through these Swarovski EL Traveler 8x32 binoculars with that of my control binoculars. I conducted these tests on a clear afternoon: In terms of image brightness, the Swarovski's were much brighter than that of my benchmark 8x32's, this was most noticeable when looking into darker shadowed areas. But what was most impressive was that to my eyes, the image brightness was as good as my full sized 8x42mm benchmark binoculars. This is really excellent and it is for that reason in this area, I rate them very highly and easily some of the best I have ever used. The amount of color fringing (chromatic aberration) around the edges of objects is for me always a hard one to judge, but to my eyes it was extremely minimal and only really noticeable if you are actually looking for it by closely observing the edges of light or white coloured objects sitting in front of a dark background. So once again I rate these very highly in this area. Like the colour fringing, the amount of softening of the image on the periphery of the view is very minimal and almost non existent. Whilst I can say that I have seen binoculars with about the same amount, I can't say that I have ever seen a binocular with less and so once again rate these very highly in this department. The colour reproduction looks and feels natural, unlike the artificial tints that you sometimes find on cheaper binoculars. I also thought that contrast of the image was also very good and once you have correctly focussed on an object the image is pin sharp. Overall and to sum up, I would rate the view through these Swarovski's as one of the best that I have ever tested and they are a pure pleasure to look through. In terms of brightness, they compare very well to may excellent quality full sized binoculars which for me is extremely impressive. 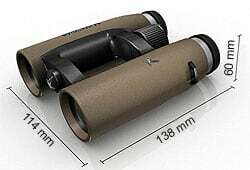 Binoculars with 32mm objective lenses are a common choice for mid-sized binoculars. This is because they strike a good balance between light gathering potential and size of the device. Good light gathering ability is important because quite often you will find yourself in situations where the lighting is sub-optimal, especially in thickly wooded or forested areas, early in the morning just before or at sunrise or late afternoon when most birds and other animals are at their most active. Full sized binoculars with larger 42mm objective lenses will have the ability to let in more light, but will obviously also be bigger and heavier and so harder to carry about in the field and put in with your luggage. 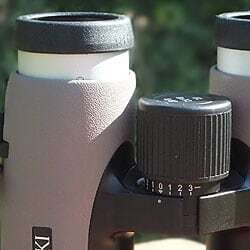 To explain how this configuration works, all 8x42 binoculars have an Exit Pupil of 5.25 and a Twilight Factor of 18.3, which if you compare them to this 8x32 binocular, which has an exit pupil of 4 and a twilight factor of 16, it shows that the increased objective lens diameter of a larger binocular will gather more light and make it possible for the binoculars to transmit more light and thus should in theory work better in low light conditions. More compact binoculars with smaller lenses will of course let in even less light, but will be even more compact - so it is all about compromises and that is why a mid-sized binocular like this is a great choice for most uses and make great general use and travel binoculars. I would also like to add that these exit pupil and twilight figures do not take into account the transmittance or quality of the optical system, which is as important, if not even more so in producing a bright image. This is because the performance of a pair of optics in poor light also depends a lot on the quality of the glass and optical coatings and not just the exit pupil and twilight factor formula. Good coatings on the lenses and the prisms can double the amount of light that gets through the binocular, when compared to those that have none or poor quality coatings and as we have already discovered these Swarovski binoculars use excellent quality glass as well as coatings and that is why they produce an image that is so excellent. This table really highlights just how wide their field of view is where they rank with the very best. Swarovski call it their "field bag" and it even comes with it's own instruction booklet. The semi-soft bag is very well made and has enough padding to protect your optics from most normal day to day bumps and bangs. Inside there is plenty of room and the binoculars fit inside very easily. This may seem like a very minor point, but I can't tell you how annoying it is to have a bag that fits the binoculars so tightly that it makes it difficult to take out and replace your optics in the field, a problem that occurs way too often. There are also two pockets inside the bag, ideal for storing lens cleaning cloths, some money of even your car keys. The field bag comes with it's own strap that attaches to it with a couple of quick release clips and the bag can be worn in three ways: around your neck, over your shoulder or around your waist. Overall it is an excellent case and definitely one of the best I have ever used. 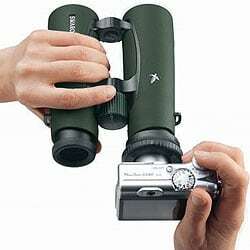 This Swarovski binocular has the best neck strap that I have ever had on a pair of binoculars. It is very well made, is well padded, is wide enough to distribute the weight well and it is also curved making it sit better on your neck and therefore is very comfortable. The best bit however is the ease at which you can adjust the length of the strap - with just the flick of a flap on the strap you can quickly and easily adjust the neck strap to any length you want. Because it is different from almost all other straps that I have ever used, it did take me longer to fit it as I had to use the instruction manual, but once the strap is attached to the binocular it is well worth the little extra effort. The objective lens covers are made from a soft rubber and they fit very well into the ends of the binocular and should not accidentally fall off. A feature that I really like is that they have a rubber loop that attaches them to the barrels of the binocular which saves you from having to put them somewhere safe every time you use your binoculars. If like some people, you don't like to have the lens caps hanging down from your binos when you are using them, you can also just take them off and put them away. I love the rainguard (eye-piece cover) that comes with the Traveler. Made from plastic, it fits very well to the eyepieces and has loops that enable it to attach to the neck strap. But the bit that I really love is that it has a central hinge between the two cups that allows for the different distances between the two eyepieces depending on your inter-pupillary adjustment. This is something that is often overlooked by manufacturers meaning that the eyepiece covers will not fit, unless you store your binoculars fully open, which can be a real pain as you have to adjust them every time you use and replace your binoculars. It may be a fairly small thing, but for me it is another example of the great attention to detail that Swarovski have show in producing these binoculars. The binoculars also come with a very good quality microfibre lens cleaning cloth as well as a moistened disposable cleaning tissue. Inside the box you also get an instruction booklet that contains information on how to properly care for and clean the binoculars as well as how to properly attach the neck strap, adjusting the eye-cups, interpupillary distance adjustment, adjusting the focus and diopter adjustment. It also contains the card for the Swarovski limited lifetime warranty. Swarovski's Snap Shot Adapter enables you to connect your digital camera to the binoculars and take surprisingly good quality photos even at long distances. The supplied ring connects the Swarovski EL (and SLC series) binoculars directly to your digital camera thus creating a camera lens. Most digital cameras that have a max. 4x optical zoom and extendable objective lens are suitable. I tried the snapshot adapter out using my little and now rather outdated Panasonic Lumix DMC-FS3. Getting a pin sharp focus, especially on nearer objects is a little tricky but is possible and as you would expect you need to keep your hands as steady as possible to prevent camera shake and blurring of the image. But on the whole I was rather pleasantly surprised by the results. The first photo below was taken just using the camera (1x zoom) and to show how close you can get, I took the second photo below from the same position using the snapshot adapter and the 8x El Traveller Binoculars - I also used the 3x zoom on the camera, giving at total of 24x zoom - pretty impressive! Strong Points: What really stood out for me on these Swarovski binoculars was just how excellent the view through them is and I would almost describe them as optically impeccable. This is achieved by the use of top quality optical components and coatings. The quality of the workmanship and the attention to detail is also very impressive and I love the quality of all the extras like the carry case, neck strap, lens cleaning cloth and the fact that you get the snap shop adapter is a real bonus. The very wide field of view is also something that cannot be stressed enough and is as wide or wider than almost all others in their class. Weak points? To be honest these binoculars really do not have any weak points - the only thing that you could wish for is a cheaper price tag. But as they say, in life you get what you pay for and in this case you really do get one of, if not the best mid-sized binocular on the market. So if you are the type of person that demands or needs uncompromising quality and performance then these Swarovski EL 8x32 W B Traveler binoculars may be the optics for you. Ideal Uses: As their name suggests and like most mid-sized binoculars, they are ideal binoculars to go travelling or camping with, they also make excellent safari binoculars although some people may prefer the more powerful 10x version. 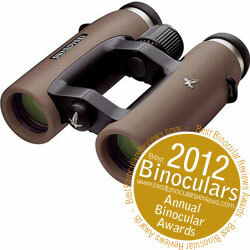 The 8x magnification and extremely bright image also means that they make ideal birdwatching binoculars. Their fairly close minimum focussing distance means they will hold their own as a binocular to view things like flowers, butterflies, dragonflies and other insects really close up, but if this is your main intended use for them, you should look for a pair that has a much closer minimum focusing distance. 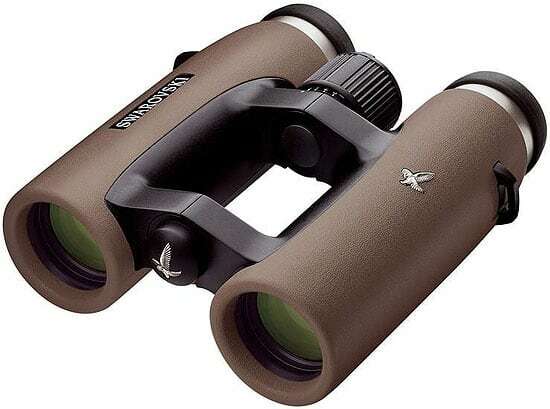 I would also say that these Swarovski Traveler EL binoculars would be excellent for general wildlife observation and even some types of hunting where size and weight are important. Like most mid-sized binoculars these make a good all-round general use binocular. Their fairly compact size and really wide field of view also make these ideal optics to take to most sporting events where a wide field of view allows you to see more of the action at once without having to look around. My experience of them whilst travelling through northern Spain and the Pyrenees mountains was excellent and they were extremely practical to use and take on my travel's. They were easily compact enough for me to fit them in with my luggage and if I was flying, I could have taken them on board with me in my hand luggage with no problem. Their small size, low weight and the very comfortable neck strap also meant that taking them on a long walk or hike in the mountains was as comfortable as it gets. I also love the open bridge design that makes them easier and more secure to carry them in one hand whilst climbing up or down steep and difficult terrain, this helps to ensure that both you and your optics remain undamaged! Their really bright and high quality image also helped me a lot when I was birding in the more thickly forested areas as well as early in the mornings just at or before sunrise when the birds and other wildlife was at their most active. Their very wide field of view is also very noticeable when I compared them to most other binoculars and this just helps you to quickly locate and keep track of things like fast moving and erratic birds. Overall, as you may have realized by now, I am a big fan of these binoculars and for me they really are one of, if not the best mid-sized binoculars available and I would have no hesitation on taking them with me on any of my future ravels, or even for just on a walk in the countryside by my house. 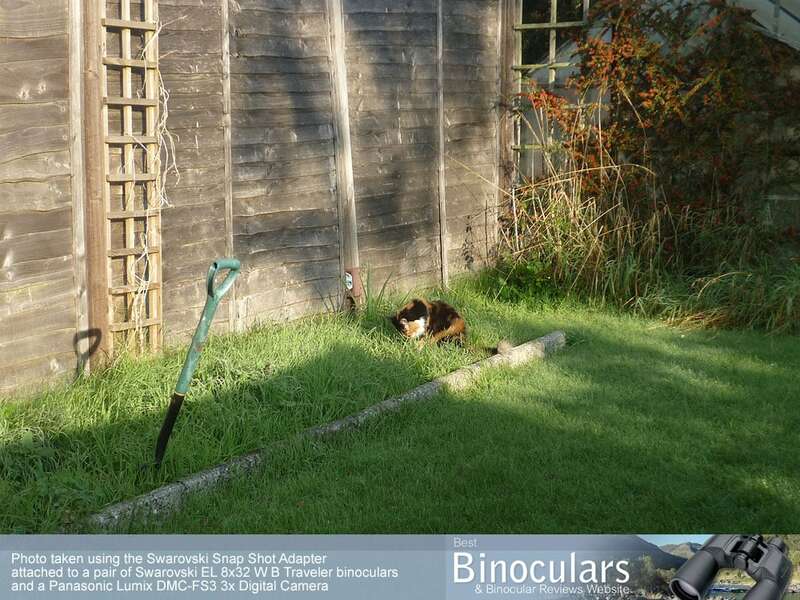 I would like to thank Swarovski Optik for sending this binocular to me to review. 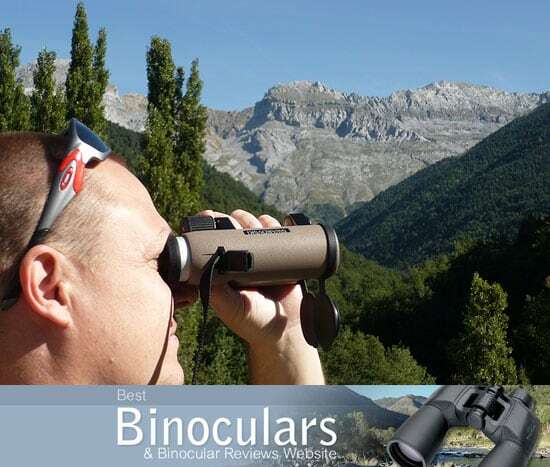 I would also like to point out that all the reviews on this site, including this one are my opinion of the binocular and are not influenced in any way by manufacturers, distributors or suppliers. Quality mid-sized waterproof and fog-proof binoculars that feature the comfortable open bridge design and come with high quality optics.